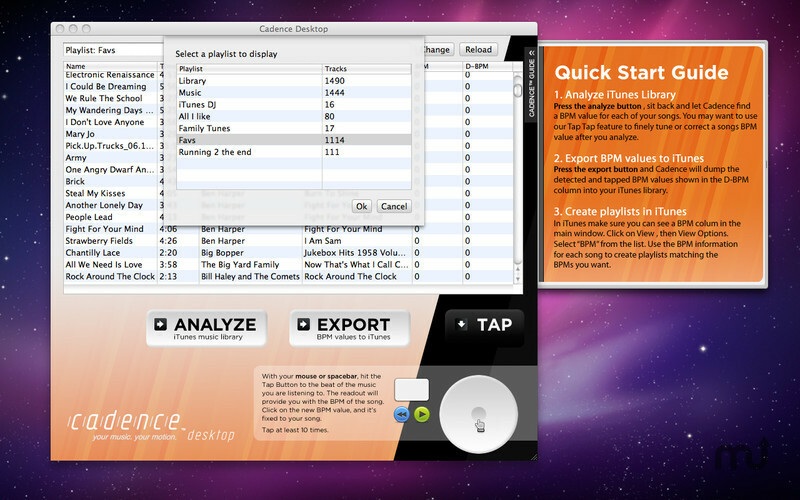 Analyze your iTunes library for the BPM of each song. Is there a better alternative to Cadence Desktop Pro? Is Cadence Desktop Pro really the best app in Audio category? Will Cadence Desktop Pro work good on macOS 10.13.4? Cadence Desktop has its own unique BPM detection magic wand developed from the ground up. Quick BPM detection of Mp3, WAV, AAC, Apple Lossless and AIFF formatted songs. Export the detected or manually tapped results to your iTunes library. Select just the playlist in iTunes you want to find BPM's for. Fix for finding the default iTunes library. Fix for filtering DRM music and showing and hiding songs with existing BPM values. New error handling and specific error problem feedback is now available per song. Cadence Desktop Pro needs a review. Be the first to review this app and get the discussion started! Cadence Desktop Pro needs a rating. Be the first to rate this app and get the discussion started! Use the integrated Tapping button to fine tune results. Just tap along to the song and the BPM will be shown to you. If you use iTunes match, your songs must exist on your machine for Cadence Desktop to analyze them. You should pull down from iCloud the songs you wish to analyze. Your iTunes music library must be created in German, Danish, French, Swedish, Spanish, Portuguese or Dutch for it to work with Cadence Desktop. If it is not, your music will not show up. DRM protected music can not be analyzed. If you upgrade your iTunes music to iTunes Plus they will analyze just fine however. Due to the new sandboxing Apple requirement your music must exist in the default iTunes directory. An updated version is coming which will allow for using a iTunes library located anywhere including External drives.